If you’re looking to get CarPlay for your Kia Soul, the Korean carmaker has added a map update for 2015 models which adds Apple’s CarPlay, along with Siri Eyes Free with iPhone, allowing users to press and hold the steering-wheel mounted button to initiate the iOS virtual assistant. The map update also includes updated interface updates, better voice recognition, faster Bluetooth pairing and improved UVO eServices. 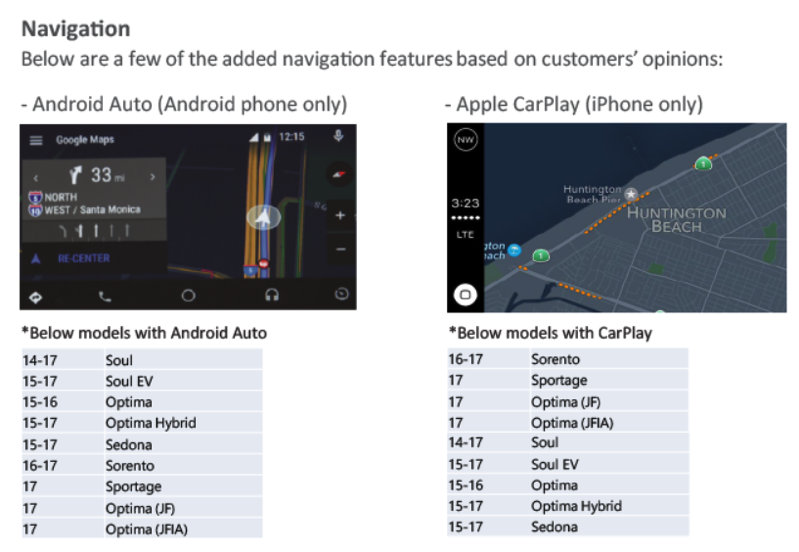 It alls sounds great, but map version “NAM.09.47.44.543.001.1 (V10.5)” will cost $199 USD if you’re looking to update and get access to CarPlay, which is already available for a variety of other Kia models, including: 2016-17 Sorento; 2017 Sportage; 2017 Optima; 2014-17 Soul and 2015 Soul EV; 2015-16 Optima; 2015-17 Optima Hybrid; and 2015-17 Sedona. The 10.5 map update was released today and the installation time takes approximately 35 minutes, according to Kia. Anyone jumping on this?